Rumors of a Swedish House Mafia reunion had been circulating for quite some time. As the weeks drew closer to Miami Music Week, the rumor mill began buzzing even more than in the months, and even years prior. Would dance music’s beloved Swedish House Mafia be making their comeback on the very same stage where they performed their very last show? Would their final stomping grounds where they abruptly ended their notorious project five years earlier be the place where they’d have their long-awaited reunion? As the days neared closer to Ultra’s 20th anniversary, subtle hints were dropped across several social media pages. Nightlife mogul, David Grutman, the owner of LIV and Story nightclubs, posted images on his Instagram throughout the weekend, teasing a SHM reunion. Various DJs, the media, locals, and the guys themselves, all fueled the fire over the course of Miami Music Week as events like the Axtone pool party hit SoBe on Wednesday and Axwell /\ Ingrosso headlined the Ultra Main Stage on Friday. The conscious decision to close out their career as SHM, while they had reached their peak, allowed the trio to never truly leave the spotlight. Their teams readied a strategically implemented, well-executed plan for a grand reunion five years later, to make history at the Ultra Music Festival Main Stage – and it was brilliant! Following a 30-minute intermission, it was time for Axwell, Sebastian Ingrosso, and Steve Angello to take their spot on the Ultra 20 Main Stage. It was time. That’s what the three members of Swedish House Mafia revealed just before taking the stage. Reuniting at Bayfront Park almost felt serendipitous and full circle. As an intro edit of “Miami 2 Ibiza” blared from the speakers, the roars from the crowd (even those who lost their voices) could be heard from miles away in South Beach. It was time. It was time for the reunion that we’ve been waiting for, for the last five years. From afar, they truly resembled three dots — and people on-site, watching the live stream, listening in, and even bystanders, were loving it. Flames that soared stories high engrossed Ingrosso, Axwell, and Angello as they were seen hovering above the crowd which spanned all the way to the outer perimeter of Bayfront Park. From “How Do You Feel Right Now” to “We Come, We Rave, We Love”, it’s likely you weren’t able to find a single person in attendance who wasn’t overjoyed to be there. 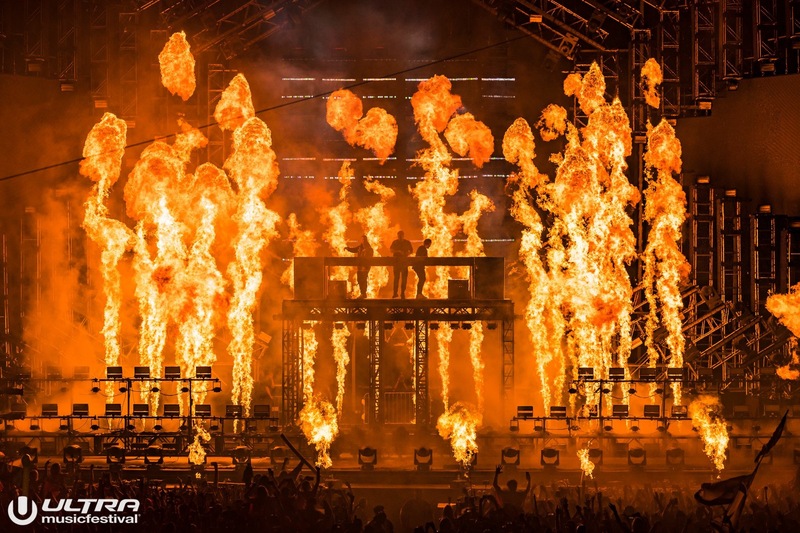 Amid the fire and flames, throw in two new SHM IDs, a plethora of mash-ups, along with familiar favorites like TV Rock “In The Air (Axwell Remix),” “Reload,” “Antidote,” and “Save The World,” all before Led Zeppelin’s “Stairway To Heaven.” The final 20 minutes consisted of “Don’t You Worry Child” along with The Temper Trap “Sweet Disposition (Dirty South Remix),” Axwell /\ Ingrosso “Dream Bigger,” and SHM’s infectious “One” feat. Pharrell Williams. Countless hits together as SHM, two documentaries, a mix album, it’s likely this is just the re-birth of Swedish House Mafia. Considering the direction electronic dance music has taken, and the path that it’s headed, the resurgence of SHM is exactly what the dance music community needed (even if they didn’t know it, or they’re too ashamed to admit it.) This time, the Swedish House Mafia is for life!